I'm trying to install flash on Lubuntu 16.04, Lenovo s12 2959, and Chromium doesn't seem to detect flash. Need to get 6 832 B of archives. 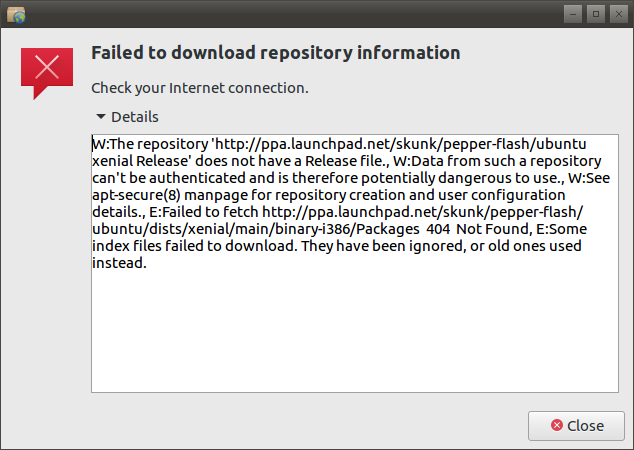 W: The repository 'http://ppa.launchpad.net/skunk/pepper-flash/ubuntu xenial Release' does not have a Release file. Then I went to Preferences -> Software & Updates, check there's enable Canonical Partners repository, it was..
Is this something that I have done incorrectly? How can I fix this? Browse other questions tagged 16.04 lubuntu flash chromium plugins or ask your own question. How do I get Burg on 16.04?